Analysis: Why A Chinese Leader Told The Story Of 'A Devil And A Demon' China's Vice President Wang Qishan likes parables. In Davos he told a story to answer a question on U.S.-China trade relations. 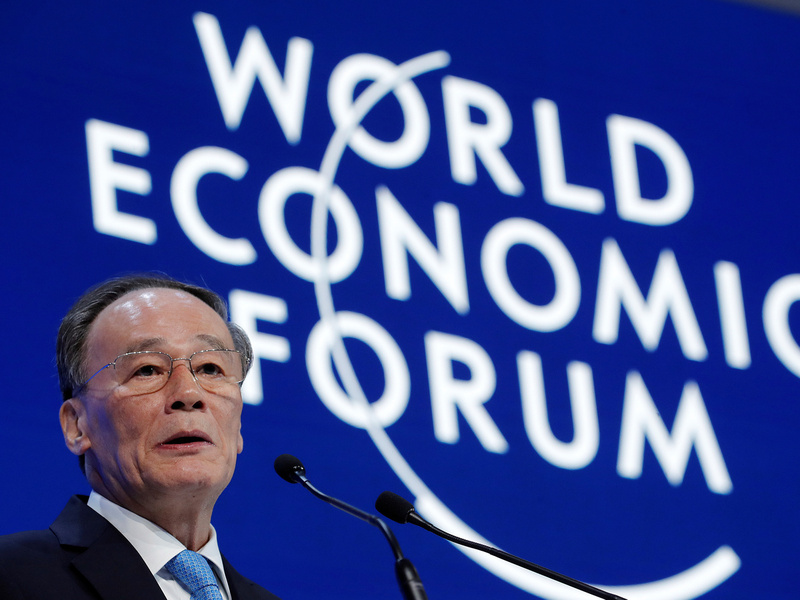 Chinese Vice President Wang Qishan speaks at the World Economic Forum annual meeting in Davos, Switzerland. His message: The U.S. shouldn't expect too much from China when it comes to cracking down on intellectual property theft. China's Vice President Wang Qishan likes parables. He offers tales from ancient China when he wants to make a point. "In Chinese history, there was a story of a devil and a demon," Wang said. He prefaced this by saying it's a story he would often narrate to his former colleagues at the central bank where he oversaw financial supervision. The minute I hear Wang say "devil and demon," I look quizzically at my colleague Gregory Warner, host of the NPR podcast Rough Translation. He seems just as mystified as me. To us, both words kind of mean the same. But we both instinctively know there's a lesson in this story. Wang then continues by saying the ancient tale is analogous to that of a policeman and a thief. He says it's impossible for the police to always be ahead of the thieves and be at the scene of a theft before it occurs. "In that case, there will be no thieves in the world." To expect that, he said, would be "idealistic" and "too good to be true." Wang's story seems directed at the United States. After all, it's an answer to a question about U.S.-China trade relations. Pompeo said the U.S.-China trade relationship will be determined by not just the free and fair democratic principles that America stands by, but "the capacity for American businesses to operate in China without risk that their trade secrets and their intellectual property will be stolen." Pompeo pointed out that when American companies are forced to transfer their technical know-how in China, "those aren't fair arrangements," and that America is rebalancing its relationship with China along those lines. Wang continued his story by saying that "if 60 percent of the thieves could be caught and things stolen could be recovered, then we will have significantly fewer thieves. But if there are no thieves at all, that will be too good to be true." Wang's message? The U.S. shouldn't expect too much from China when it comes to cracking down on intellectual property theft. The U.S. could stop some of it but it can't stop it all. In fact, that is not how the world works. This message is not going to sit well with Pompeo or with U.S. Trade Representative Robert Lighthizer, America's chief trade negotiator. Lighthizer is slated to sit down Wednesday with a top delegation from China led by Vice Premier Liu He. In December, Lighthizer told NPR that American innovation is "the lifeblood of the American economy." In the interview with All Things Considered, he said "failure to protect intellectual property" is a serious problem. The Davos meeting was happening in the midst of an anti-globalization backlash. In France, people in "Yellow Vests" swarmed the streets of Paris and other cities to protest a fuel tax hike. But soon it was clear their concerns stemmed from a broader discontent and feeling left behind in an elitist, globalized world. Brexit was fueled by similar sentiments as was the "America First" rhetoric. Wang said the imbalances of globalization create clear winners and losers. And the angry responses of people left behind are "inevitable." However, it is the job of these countries to make "the pie bigger" and "strike a better balance." Wang then went on to expound on Charles Dickens' A Tale of Two Cities, and the opening line in the book: "It was the best of times, it was the worst of times." Wang said the lessons from that line have held true over time dating all the way back to Ancient Rome and Greece. We asked Rough Translation producer Jess Jiang, who is fluent in Mandarin, to help us understand Wang's devil and demon story? She said they represent the bad and the good, which is why the thief and the police is a useful analogy. In Jess' translation, Wang ends his story this way: "To say there are no thieves, is an impossibility."